October 19th Carnegie Library Museum 7 p.m. Artist, art historian, curator, and author, Des Moines resident Amy Worthen is known world-wide for her scholarship and creative art. Over her 50-year career, her work has been shown in museums throughout the US and Europe, including the MET, Smithsonian, and the Boston Museum of Fine Arts. Worthen specializes in the centuries old art form of print-making and engraving, in which she carves designs into a metal plate, which is covered with ink, and then ran through a high-pressure printing press, transferring the image from the inked carved plate onto paper. 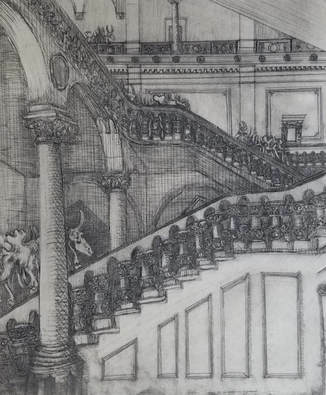 Amy's interests are revealed in her prints, which blend architecture and history with fantasy and humor, as in the print on the left, where animal skeletons climb a grand staircase. She is well known for her print series on the Capitol Building and Terrace Hill in Des Moines, as well as others that focus on nature and Venice, Italy (her second home). On October 19, Hometown Heritage and ISU's Brunnier Art Museum will host Art Historian and Curator Lea Rossen DeLong, who will discuss how Worthen's travels influenced her art and her works which depict life in Iowa. This lecture complements the ISU's Brunnier Art Museum exhibit The World in Perspective, which shows Amy's works from her childhood through life today.